Where are all the women going? Brexit and the Government’s Article 50 battle are a firm fixture in the headlines at the moment, and some commentators have noticed a lack of diversity in the judges and barristers involved. The BBC presents some stats about diversity in the legal profession in this article but they don’t give the complete picture for women in the law. The statistics quoted for solicitors – 49% female, 51% male – sound pretty reasonable on the face of it, being broadly in line with the overall UK population. But anyone acquainted with the legal profession knows that these overall stats cover up a stark difference between those at the entry level and those at the more senior levels. I pulled together a few other statistics and came up with the graph below. It’s pretty crude but the trend is clear: there is a significant drop in the percentage of women at partner level in law firms. Significantly more women than men study law at university, and significantly more women than men qualify as solicitors. But fast-forward a few years and women represent just 33% of law firm partners. 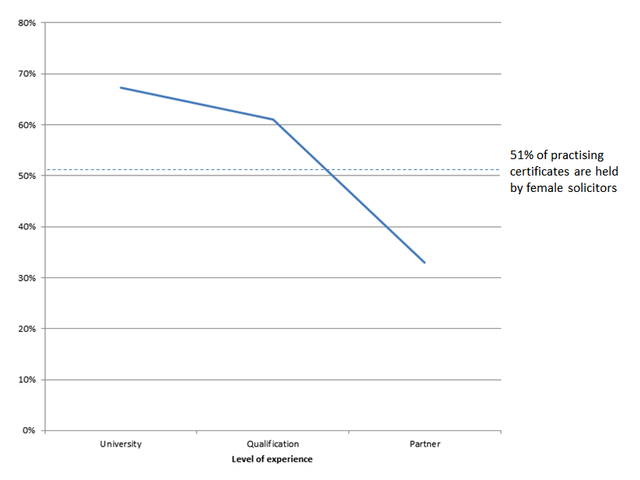 The SRA’s statistics show that the picture is worse in firms with 50+ partners, where only 27% of partners are women. The Lawyer published an interesting examination of the reasons in 2015 which is really worth a read. With the government's battle over Article 50 going to the Supreme Court, there has been much comment about the gender and ethnic make-up of the judges and barristers at work. How accurate a reflection is it of the legal profession's make-up? "Not much sign of diversity," writes one woman, showing a still photograph of proceedings in the Supreme Court, a group of white middle-aged men engaged in debating issues of enormous constitutional importance. "More to do," adds another, male Twitter user. "Glad to see the diversity of the UK so ably represented by a large group of white middle-aged men," adds another. On the other hand, someone writes: "The most important Supreme Court case in UK history & these numpties are worried about diversity?" And another suggests commentators, including the BBC, should "shut up about this non-issue".